Sometimes it’s difficult to avoid a cliché. Doire Trasna were excellent one half, disjointed the next against an almost unrecognisable Slaughtmanus team who were destroyed for 30 minutes before almost completing the unlikeliest of second half comebacks. In-house disputes have decimated St. Mary's, meaning they fielded only four players - Ronan Cooke, Ryan Barr, Cahir Cooke and Edward Devine - who were involved in last season's Intermediate Championship final defeat to Castledawson and it showed in the opening half against Enda Linsday's Trasna. The Waterside men breezed to a 2-07 to 0-2 half-time lead thanks to a constantly rotating front line of Darren Harkin, Colin Murray and Cormac Carlin that was superbly fed by Michéal McNaught in a play-making role. It was one-way traffic with Slaughtmanus staring down the barrel of another heavy defeat after last week's mauling by Claudy. Fast forward another 25 minutes or so though and it was Trasna more than thankful for Dee Starrett's late free which took put five between the teams with three minutes left. Trasna played with the wind first half yet the reason for the second half transformation was not as simple as the conditions. Eleven points up, Pearses took their foot off the pedal and placed too much emphasis on ball retention. Possession is all very well but it needs a purpose and Trasna over-complicated things after the break. 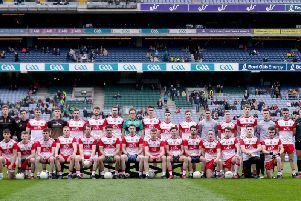 They stopped finding Harkin and Murray and once the forward momentum went out of their game, it offered Slaughtmanus a foothold they gratefully accepted, with Caolan Watson and Lee Toland excellent for St Mary's. Trasna managed only two points after the break, both from frees, and the disappointment for Slaughtmanus' was it took them until the second half to make a game of it. This St. Mary's team won't win any championships and face a battle at the wrong end of the table unless they get some experienced men back but, on the evidence of their second half, they won't get relegated. The win leaves Trasna with two wins from three but it is difficult to assess the performance. For 30 minutes they were excellent, going six points up inside 16 minutes thanks to well worked scores from Starrett (3), McNaught, Carlin and Murray. Slaughtmanus did have the odd foray forward but like their front three, those were isolated. Trasna's first goal arrived 20 minutes in, the only surprise being it took that long to arrive. Harkin picked up possession in the left-corner and turned Sean O'Kane but saw his shot strike the bar before falling perfectly to midfielder Connolly Deeney who found the bottom corner with an excellent finish. Slaughtmanus responded with their first point through Watson but 21 minutes in, the 1-6 to 0-1 scoreline told its own story. Things got worse for the visitors four minutes later. When McNaught's high effort was helped onto the crossbar by St. Mary's keeper Ronan Cooke, the ball again fell nicely for a Trasna player as Colin Murray this time gathered, turned and scored low for 2-6 to 0-1 with the sides added one final score a-piece to end the half. Trasna replaced Cormac Carlin at half-time but failed to get started after the break. Perhaps they believed the job was done but the young Slaughtmanus side set about setting them straight almost immediately. There was no great tactical shift, more a casting aside of caution as Trasna invited them forward. Points from Watson and Connor McGee served notice of an improved performance which forced Trasna deeper and deeper to the extent that McNaught found himself in a sweeping role in front of his full-back line. McNaught's free looked to have stemmed the tide but when Edward Devine's brilliant through ball perfectly picked out the run of McGee who swept a superb finish past Martin Healy, the 2-08 to 1-4 deficit suddenly looked bridgeable. Starrett's free allowed Trasna to breath a little easier. Brendan McGilligan grabbed the last point of a strange game which Slaughtmanus may have taken more from than Trasna.